Today the church remembers William Wilberforce, 1833, and Anthony Ashley-Cooper, Lord Shaftesbury, 1885, Prophetic Witnesses. 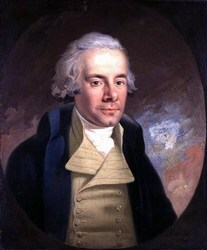 Just and eternal God, we give you thanks for the stalwart faith and persistence of your servants William Wilberforce and Anthony Ashley-Cooper, who, undeterred by opposition and failure, held fast to a vision of justice in which no child of yours might suffer in enforced servitude and misery. Grant that we, drawn by that same Gospel vision, may persevere in serving the common good and caring for those who have been cast down, that they may be raised up through Jesus Christ; who with you and the Holy Spirit lives and reigns, one God, for ever and ever. Amen.